Laura Mulvey shares with The Cine-Files her close analysis of a moment in Bani-Etemad’s Under the Skin of the City (2001). Her essay originally appeared in Film Moments (BFI/Palgrave McMillan, 2010). Additional excerpts from Film Moments have been made available online via the Palgrave MacMillan website. The ‘moment’ that I have chosen to discuss takes place in a film that brings together two cinematic stylistic traditions, social realism and melodrama. In her film, Under the Skin of the City (Iran 2001) Rakshan Bani-Etemad uses both to tell a story about crises rooted in class and gender inequality in contemporary Iran. This film encapsulates the way that realism and melodrama are, in different ways, stylistically important for dramas of social oppression and injustice. Realism records the state of things, without stylistic intrusion into a representation of the norms of everyday life and its fragile survival strategies. These are conditions that lack buffer zones or safety valves; misfortune or error can quickly mutate into disaster leaving its victims struggling to comprehend, unable to articulate clearly their suffering or the strain that leaves close relationships fissured. It is here that melodrama serves its purpose and the cinema takes on an expressive function that responds to both the intensity of the crisis and its protagonists’ desperation. There is, of course, an implicit chronology in this dual style: in the order of the narrative, the melodrama takes over from realism’s depiction of a day-to-day state of things. Under the Skin of the City is about a working class family in Tehran, primarily revolving around the figure of the mother, Tuba (Golab Adineh), and her beloved eldest son, Abbas (Mohammed Reza Forutan). Their intense affection introduces another element intrinsic to the melodrama: a crisis affecting family life, particularly, the mother. Early on, before the film comes to make use of a more marked melodramatic style, the space of the family home is established: the small house with its courtyard surrounded by high walls. For Tuba, the house stands for her motherhood, her love for her children and their love for each other. The house next door, identical in layout, is tyranised by a brutal and conservative eldest son so that the high walls are more resonant of a prison than of maternal comfort. In contrast to the relative stasis of this space, Abbas moves around the city on his motor scooter, across wide shots of cityscape, motorways and surrounding urban development. For him, this should be a success story, an escape from the constraints imposed by class, lack of education and the destiny that seems to hold the family in poverty and impotence. He sees migration to Japan as the almost magical means to establish control over his own story, to rescue his mother from her debilitating job in a textile factory, to ensure a university education for his younger brother, Ali (Ebrahin Sheiabani), and sister, Mehboubeh (Baran Kosari). And on his successful return, he will marry the young woman he longs for from afar, now way beyond his social reach. While melodramatic style tends to draw attention to itself, realism is associated rather with transparency. Under the Skin of the City however, is ‘bookended’ by two remarkable scenes of filmmaking, as a documentary crew interview Tuba and her fellow women workers about the coming parliamentary elections. These scenes draw attention to the constructedness of the filmmaking process as such but also vividly sketch, in a brief vignette, the lack of weight given by the interviewer to women’s words and the problems they struggle to articulate and the carelessness with which they are treated. The presence of the cinema as process thus flows over onto and into the first section of the film and its relatively transparent style. Various events, however, precipitate a crisis that takes the film out of its early equilibrium. In his struggle to raise money for his visa, Abbas sells the family house to a developer; the story collapses around him and with it the fragile security of everyday life that Tuba struggles to maintain. The ‘documentary’ scenes are also a reminder that this family had already appeared briefly in Bani-Etemad’s 1998 film The May Lady in which the presence of cinema and the filmmaking process had played an important part. The protagonist, Forough, is a middle-class documentary director who has been commissioned to make a film about motherhood during which she encounters Tuba, one of many working-class mothers whose tragic stories she tries to tell. By this time Abbas is in gaol and it is possible, retrospectively, to piece together the terrible aftermath of the 2001 film. Increasingly aware of the gap between her filmmaking process and the reality of the women’s lives, Forough finally abandons the commission. It could be that Bani-Etemad turned towards a more melodramatic style in order to attempt to express the gap between the medium and its aspiration to capture reality. 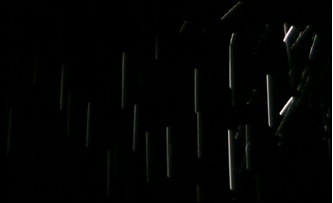 As Under the Skin of the City shifts away from transparency, the narrative begins to fragment into emotionally charged tableaux, sounds (repeated and exaggerated) lose their natural place in space and time, and the camera’s angles and framings become tinged with strangeness, a dislocation that reflects the characters’ disorientation and pain. This shift is quite slight rather than heavily marked, so that the film’s use of a more melodramatic style demands attention and interpretation. I am not suggesting that Under the Skin of the City could or should be classified as a genre film ‘melodrama’. But, as certain dramatic situations arise, as characters are caught in impasses that cannot be transcended, the film summons up formal means of marking emotional crisis and the collapse of everyday normality. In this sense, the film is not following generic rules, but conveying visually the characters’ emotional distress and impotence in the face of events. The emotional crisis comes to a head around the discordant aspirations of mother and son, one centred on maintaining the family home, the other sacrificing it in the hope of escaping from its class bound world, one represented visually by the domestic space, the other invested in narrative desire. Tuba is an ordinary working class woman, mother of five children, whose husband cannot work; her job in the textile factory is undermining her health and, on all sides, life presents difficulties that she deals with as best she can. However, both Bani Etemad’s direction and Gohab Adineh’s performance subtly bring out her resilience, her humanity and an implicit intelligence. The film constantly returns to and represents the physical and ideological oppression of women and their helplessness. The fact that Tuba has no legal rights over for own home is at the political heart of the story, while the crisis is precipitated as the neighbour’s intolerance and brutality drives his young sister to run away from home. Mehboubeh visiting her friend, now living destitute in a park, is caught up in a police raid and arrested. When Tuba fails to find the deeds needed to get her daughter out of gaol, she realises that Abbas has finally sold the house. Her pain and bewilderment overwhelm the film, precipitating the scene that I have chosen to analyse. The scene consists of a single, static, shot, but is preceded by shot of a black screen crossed by diagonal, intermittent, flashes of light. The flat unreadable, space of the screen seems to summon up, in the first instance, the cinema itself and the essential elements of light and dark out of which, potentially, recognisable forms and meanings may emerge. This (very short) initial moment creates a visual disorientation in the spectator that evokes, but is not, of course, adequate to, the black hole of despair that has overwhelmed Tuba. The main shot then shows the flat blackness mutates into the darkness of night, showing the inside of the (by-now familiar) courtyard at night shot from a high angle on the outside wall. The flashes of diagonal light also mutate, out of abstraction, into streaks of pouring rain. 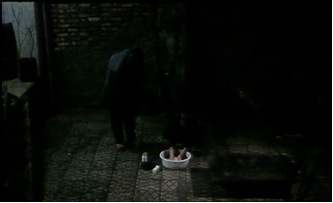 In the courtyard, in long shot, Tuba is sitting on the ground in front of a small basin in which she is washing clothes with obsessive intensity. Her automatic actions are precisely in keeping with her lifetime’s caring for her family, in which hard labour is inextricably involved with deep affection. This confusion is, of course, central to the mythologies of motherhood and, in these extreme circumstances, Tuba resorts to a performance that poignantly reflects those underlying contradictions. Washing clothes literally gives her an occupation in a moment of crisis, but in the pouring rain and darkness, her habitual actions are obviously absurd. The rain, metaphorically and metonymically, stands for her tears; but, more brutally, as a natural, uncontrollable, force, it soaks the pathetically domestic water in the small basin rendering Tuba’s gestures grotesque. It is on these various levels that the aesthetic of melodrama works: visual images become figurative, accumulating implicit meaning while avoiding literal symbolism. Overwhelmingly conscious of her inability to ‘do anything’ Tuba does ‘something’ that is symptomatic of the unconscious. As the camera maintains a distance from the scene of Tuba’s clothes washing, it draws into the shot all the constituent elements of the mise-en-scene: the space of the courtyard, the darkness and the rain. It also shows, without any sentimentality, Tuba’s crippled husband who briefly remonstrates with her (‘this is no time for doing the laundry’) and wraps his jacket around her shoulders before slowly and painfully retreating back into the house. His gesture is not empty but personal and affectionate and in character, but marks, at this point, the inability of any individual to penetrate the mother’s despair that this scene renders with a fusion of melodrama and restraint. In this scene, the typical and homely is displaced into an empty gesture that caricatures the domestic and its very irrationality becomes the sign of a core resistance to a dominant ‘rationality’. From a dramatic perspective, there are two aspects to the scene. In the first instance, it vividly shows that, in this relentless situation, Tuba is able to transform an action belonging to the everyday into a symptomatic action that evokes both her unconscious and a wider, collective, unconscious of women unable to express, speak or articulate the pain and injustice they suffer daily. Secondly, Tuba’s intense feelings are woven into the mise-en-scene and cinematic style, so that the spectator is forced to read the screen and move beyond any straightforward identification with character. Although the film has often shown the mother’s face (lined by hard physical labour and unrelenting anxiety but enlivened by humour, affection and intelligence) there is no cut to close up to break up the integrity of the shot. In this scene, the whole space evokes Tuba’s emotions but also presents a topography that demands a further reading from the spectator. On one level, her irrational action is expressive of the way that her situation is beyond words. On another level, the film responds to that wordlessness and compensates for it cinematically. The scene does not ignore its participants’ consciousness, but extends it formally with a cinematic consciousness that, while it might break with the unities of realism is determined, and then stylistically overtaken, by the destiny or lot in which the characters find themselves. It is here that the film’s style relates to melodrama. However, rather than consciously citing melodrama as a pre-existing or generic formula, known, for instance, from Hollywood or the popular Indian cinema, Under the Skin of the City seems to suggest that mise-en-scene and the language of cinema must, and should, acknowledge silences rooted in oppression and repression and find some way to fill in visually for the inadequacy of language. From this perspective, the cinema’s ability to move beyond language, into the cinematic, lends itself to this political form of expression and draws attention to particular conjunctures in which the political and the cinematic come together. Under the Skin of the City is exemplary, particularly due to the sparse beauty with which it juggles sympathy for its protagonists and a cinema that, while relating to them, transcends them. This is a film that resolutely maintained the clear vision of social realism, relevant to a working class milieu, until that style could no longer adequately express the class and gender derived pressures suffered by particular characters. However, the recourse to a ‘melodramatic’ style inexorably returns to the social: the style is a response to oppression and the cinematic excess is a signifier leading back immediately to class, oppression and the crisis of gender in contemporary Iran. From this perspective, Under the Skin of the City shows that the style associated with melodrama works symptomatically and appears at moments that lead immediately back to reality, even though, on the face of it, the melodramatic style bypasses realism. Finally, to my mind, that single shot of the courtyard, its melodramatic mise en scene and the intensity invested in Tuba’s action within it, ultimately leads beyond the drama of Under the Skin of the City to the difficulty of representing the problems of motherhood. By and large, the mother is easily transformed into visible cliché or disappears into a miasma of ideological or psychic confusion. Rakshan Bani-Etemad, as a woman director, has confronted these contradictions: in Under the Skin of the City she refuses to idealise her main protagonist or extract her from the everyday into the heroic. In this film, it becomes possible to understand the way a woman director can register the contradiction between in the image and reality of motherhood. At the very end, the film suddenly mutates, something beyond either melodrama or social realism overtakes the screen. The film is book-ended by a documentary film crew recording ordinary people’s responses to the coming election. As Tuba makes an impassioned statement to camera, the technicians ask her to repeat what she has just said on the grounds that there is a technical fault. She looks at the (diegetic) camera, saying ‘why can’t you film what’s in my heart?’ and then, looking straight past the camera, she addresses the audience saying: ‘who sees these films anyway?’. Tuba’s statement directly challenges the adequacy of realistic representation; that is, her heart can’t be shown and the camera crew can’t hear her words. However, the courtyard scene (that I analysed above) not only poignantly represents the suffering and contradictions of an individual, but materialises, on film and with film, a complex interweaving of signification, reaching into the unconscious and out into the intractable reality of the everyday. Laura Mulvey is Professor of Film and Media Studies at Birkbeck College, University of London and Director of the Birkbeck Institute for the Moving Image. She is the author of: Visual and Other Pleasures (Macmillan 1989; second edition 2009), Fetishism and Curiosity (British Film Institute 1996; second edition 2013), Citizen Kane (in the BFI Classics series 1992; second edition 2012) and Death Twenty-four Times a Second: Stillness and the Moving Image (Reaktion Books 2006). She has made six films in collaboration with Peter Wollen including Riddles of the Sphinx (BFI 1978; dvd publication 2013) and Frida Kahlo and Tina Modotti (Arts Council 1980) and with artist/film-maker Mark Lewis Disgraced Monuments (Channel 4, 1994).